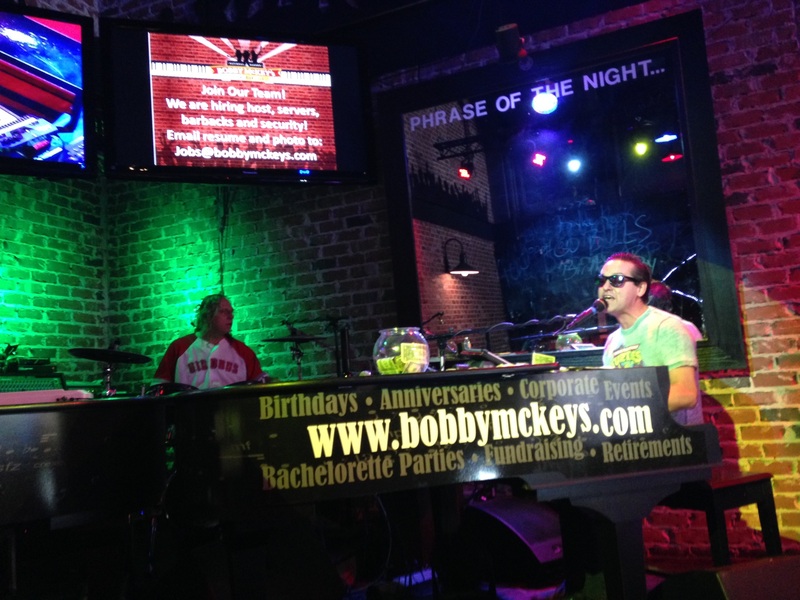 Bobby McKey's dueling piano bar is located in downtown National Harbor, Maryland, near Washington, D.C. They opened in 2008 and have been entertaining people with music ever since. Their show thrives on audience interaction, so audience members are expected to clap, cheer, and sing along. No two shows are the same at Bobby McKey's. They take requests and can perform any song in any genre, and they often incorporate other instruments like guitar, fiddle, and drums. They play, sing, dance, and make jokes, all while encouraging the audience to join in. Their team consists of five amazingly talented performers, who all have backgrounds in singing and piano. Any combination of these five musicians could take the stage. Danny, who is originally from Buffalo and has a degree in musical theater, has been dueling pianos for more than eight years. He's worked in dozens of clubs in several cities, and incorporates his theater knowledge into his performances by dancing and doing impressions. Neil, another team member, trained in classical piano for years, but also loves performing modern music at Bobby McKey's. He has played for many bands and is currently working on a solo album. Andrew, who hails from Pennsylvania, earned a degree in music education and has years of experience performing all over the United States. He has also performed with several award-winning barbershop quartets. Jimmy studied music at the University of North Texas and has experience with piano, percussion, singing, and bass. He has spent more than ten years at a few different dueling piano bars, but now resides at Bobby McKey's. Ronnie, the last member of the dueling piano team, has been playing piano his whole life and has traveled the country to perform. He's known at Bobby McKey's for his great stage presence, his humor, and his powerful voice. The piano bar provides guests with great music and entertainment every day of the week. On Mondays through Wednesdays they're open from 6 p.m. to midnight, on Thursdays they're open from 6 p.m. to 1 a.m., and on Fridays and Saturdays they're open from 6 p.m. to 2 a.m., so you can sing along to the piano tunes for hours and hours. You can buy tickets to Bobby McKey's online, but they also have standing room available. They host private events for groups of 15 to 40. They welcome birthday celebrations, bachelorette parties, business events, and more. They also have a traveling road show that allows them to bring entertainment to weddings, festivals, and other parties. The dueling pianists can perform either indoors or outdoors. Bobby McKey's is one of the most popular live music venues in the D.C. area. The pianists are all great musicians and performers, and every show includes a huge variety of music. 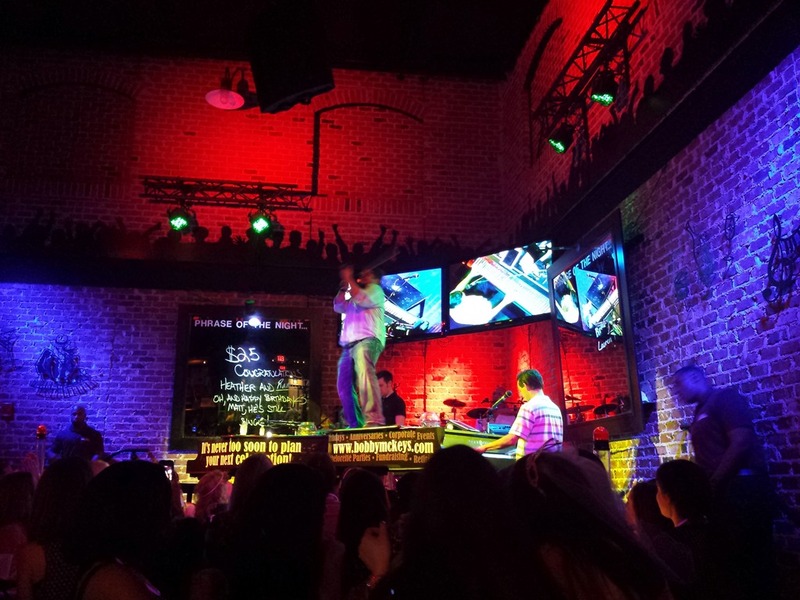 The piano bar is one of the most highly recommended venues by live music fans, and all guests can have a great time listening, laughing, and singing along. 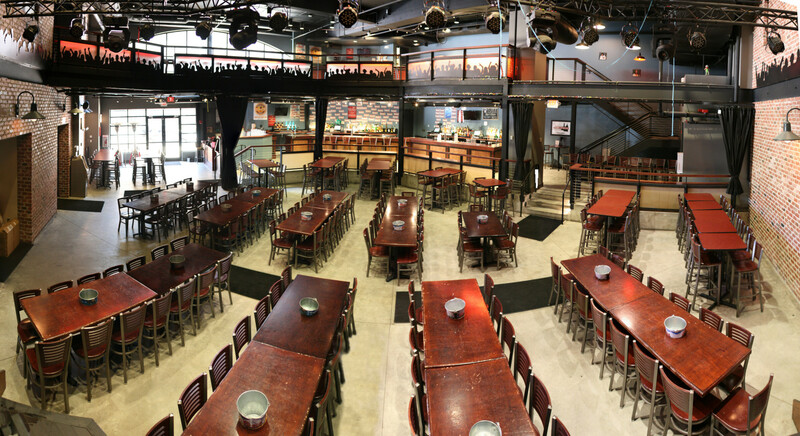 Cover Charge: Friday: $7, Saturday: $10; Mon - Thurs: $5; Additional charges for tables/seats. Parking: No dedicated parking, but there are paid parking garages all over National Harbor. The closest is the St. George Garage. Iceberg lettuce, tomato, cucumber, onion, bacon, and cheese – served with ranch dressing. Your choice of buffalo, pineapple chili, lemon pepper, Maryland-style, or Bob-B-Q sauce. Served with cucumber, carrots, pita bread, and feta cheese. Zesty Maryland-style crab dip served with Old Bay, and a generous serving of our crispy, house-made tortilla chips..
Our signature buffalo dip served with delicious house-made tortilla chips. Our very own house-made tortilla chips served with cheese sauce, fresh guacamole, sour cream, salsa, and jalapenos. Add Bob-B-Q chicken or chili for $2. Deep-fried, savory mozzarella cheese served with a hearty marinara sauce. Deep-fried to a golden brown and served with honey mustard sauce. Hummus served with cucumbers, carrots, feta cheese and pita bread, tortilla chips with salsa and guacamole. Serves 10-12 people. Deliciously deep-dish and cheesy. Add pepperoni, bacon or feta cheese for $1. Marinara sauce, provolone cheese and lettuce. Served with our signature buffalo sauce, melted provolone cheese and crispy lettuce. Did someone say bacon? Good, because these sliders are served with crispy bacon, our own house-made ranch dressing, lettuce and tomato. Our black bean burger with lettuce and tomato. Chicken, cheese, and salsa filled flour tortillas served with lettuce and sour cream. Provologne cheese, lettuce, tomato, and pickle. Bob-B-Q sauce marinated, served with cole slaw.